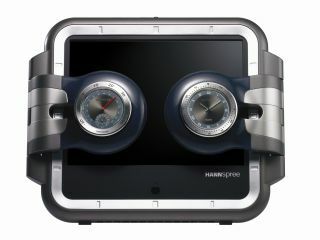 HANNspree has revealed a curious new gadget: a 12-inch LCD TV which is also a "classic timepiece" and a "meteorological information centre". It's imaginatively called the HANNStime.square and looks pretty bizarre to say the least. HANNspree is known for its quirky aesthetic designs, but this one is certainly one of the most idiosyncratic we've seen. The thin screen is flanked by two fold-out arms. When folded in, the two arms display an analogue clock as well as a curious weather instrument which measures temperature and humidity. When you decide to use the bonus TV feature, you fold out the arms which turn out to be speakers on the underside, so the TV has sound without requiring headphones. "Although small in size, the HANNStime.square packs a mighty punch with complimentary informative gadgets transforming it from an LCD TV into a classic timepiece and a meteorological information center," reads the associated press release. "Keeping you up-to-date with temperature, humidity and time, as well as your favourite TV programmes, the HANNStime.square proves that it's not the size that counts... it's what you can do with it!" And if you thought all that was pretty crazy, wait until you hear the price. Available now, the HANNStime.square will set you back a whopping £459.